For many, fridge organisation comes on a whim. The leftovers spaghetti looks good on the second shelf. Yes, yes… and the fruits are best kept in sight on the top shelf. 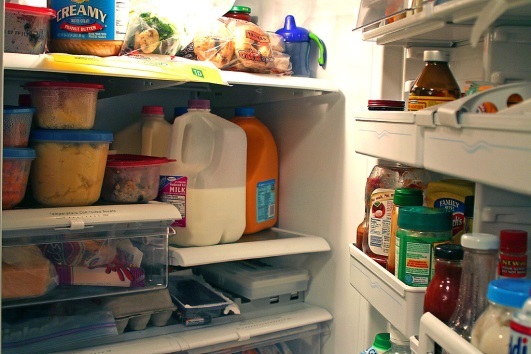 However, taking the time to put the foods in order in the fridge could reduce the amount food spoilage. Drawers at the Bottom – Raw veggies, salad and fruit. The drawers at the bottom of the fridge usually have some sort of division, allowing fruit and veggies to be stored separately. This is because fruit gives off a gas that ripens other produce. Bottom Shelves – Sealed raw meat and fish. The shelf directly above the bottom drawer is the coldest part of the fridge. Raw food should be stored here to keep it as fresh as possible and to prevent accidental cross-contamination. Middle Shelves – Dairy products and eggs. Sealed dairy products do well in the middle shelf as do eggs. The products stored in this area tend have smaller profiles (e.g. egg cartons, yoghurt cups); so, if you are pressed for fridge space and have the ability to adjust the shelves, making the middle shelves smaller can facilitate better organisation. Upper Shelves – Pre-cooked foods. Though the bottom shelf is the coldest, the top shelf holds its temperature the best. Prepared food items should be stored here, things like leftovers, deli meats and ready-made meals. As the fridge door is constantly opened, it is the warmest part of the fridge. Any items with preservatives are best tucked into door space: sauces, condiments, juice, jam/preserves, pickled vegetables, butter and soft cheese. Whether ketchup belongs in the fridge or cupboard is still up for debate, though it’s probably best to do what Heinz tells you and “refrigerate after opening.” If you do keep your ketchup in the fridge, put it in the door. On the Counter – Gas-releasing fruit and veg. Some fruits and vegetables have a plant hormone which causes the produce to emit a gas called ethylene. This gas causes fruit to turn softer by degrading the cells. Leaves droop in response, seeds and buds sprout; ethylene can wreak havoc on produce, ripening it prematurely. Avocados, bananas, nectarines, peaches, pears, plums, cantaloupe and tomatoes are just a few examples of ethylene-producing foods.